Arrive at Kigali International Airport, you will be met by our driver/guide and be transferred to your hotel in Kigali arriving for overnight on bed and breakfast. 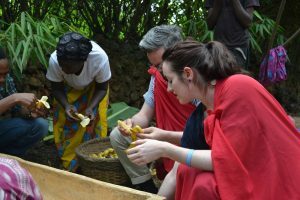 After breakfast you will depart for a 2 hours’ drive to Musanze area the second largest town in Rwanda, with its stunning backdrop of five volcanic mountains – The Virungas- Arriving at the Red rocks intercultural exchange center for a lunch that you will help prepare. Our cooking lessons involve mainly Rwandese dishes in an African cuisine and in an African Kitchen. Later in the afternoon indulge in banana beer production to understand the chemistry about the process of brewing a local beer from bananas fruits. If you find the activity interesting enough you can join the women in squeezing the juice out of the bananas and drink a glass of juice (Optional). This day is set out for Golden Monkey tracking in the Volcanoes National Park. Entering dense stands of bamboo interspersed with open glades; you will make your way deep into golden monkey territory. Guides lead visitors to the habitat of groups of ‘habituated’ golden monkeys – monkeys that have become accustomed to human presence. Have lunch, thereafter visit Red Rocks initiatives art gallery. 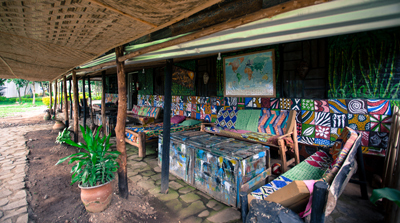 Our Art Gallery offers information of conservation of the surrounding environment; you will spend some time with the local artists. An event for which you will be introduced to conservation themes art exhibits, live painting demonstrations and you may draw your own art and take it as a souvenir. 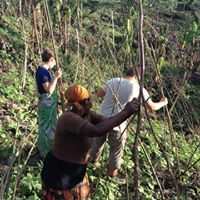 After early breakfast undertake a village walk – the tour give you a unique platform to understand the inside way of the Rwandan cultural and historical norms. During the walk you will join village families in the gardens cutting grass for farm animals. Later in the afternoon join the locals women association for basket making weaving process. Learn the long history and culture of making beautiful handcrafts items. Spend the morning hours on a gentle river in the lush countryside, near the gorillas, canoeing amongst the hills of Rwanda. Discover a special way of travel, soak up impressive views, watch abundant birdlife, float past rural communities and find excitement on the river. 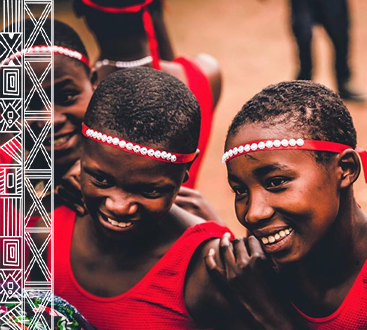 Return to Red Rocks for lunch, thereafter afternoon hours – Look into the Rwanda’s education by visiting local schools and participate in either teaching or play games with the children, that way they appreciate tourism. Get to interact with the primary school children in this remote locale and get an idea of how they lead their lives. After breakfast involve in an agricultural tour – become part of a village family by visiting their gardens, and be introduced to traditional methods of farming for an agricultural activity .While in the fields get involved in the conservation program, help the villagers to plant trees to restore the environment, be part of the conservation programs. After breakfast start the hike from Red Rocks through cultivated lands and lead you to a school on top of Rugarika hill, there is a school there – you will be welcomed by students during their break-time, have short interaction with the kids before they enter into their classes – If during school holidays you will just enjoy the beautiful sceneries and chat with locals before returning back to Red Rocks have lunch, afterwards join locals for heritage and cultural tour – a unique platform to understand the inside way of Rwandese culture and historical norms. Listen to different stories from various individuals in the society and share anticipations of a better future and learn important things of a nation which is transforming together. After breakfast drive to the two compellingly twin lakes Bulera and Ruhondo, located just adjacent of the volcanoes. Take a boat to explore the breathtaking scenery or even join fishermen with their local canoes on the lake. You will visit one of the communities living in an Island and the highest point to have some good photos of the volcanoes especially during a clear day. Afterwards drive to Red Rocks for lunch, local traditional dancers will be there to entertain. 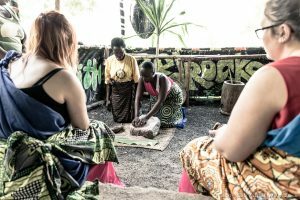 In the evening home stay, this gives you an opportunity to stay overnight with friendly Rwandan families, eat local food (help to prepare it), see how the local live through every day and listen to the evening stories. Enjoy biking in the village seeing beautiful sceneries and talk to the villagers in their daily routines. You may decide to bike towards the main town where you can stop for any bargains before heading back to red rocks. Transfer back to Kigali, optional city tour then proceed to Kigali international airport to catch flight. Arrival Kigali, airport, transfer to your hotel for overnight. Pick you from your hotel and transfer you to Mgahinga National park. The beautiful scenery referred to as the “Switzerland of Africa” will be a big spectacle as you traverse the vast country side. 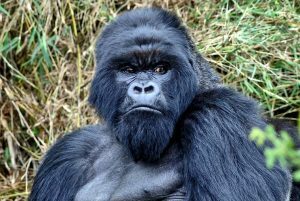 Arrive at your lodge later in the afternoon for gorilla trekking the next morning. Get up early at 6:00 and report to the Park headquarters with your packed lunch for briefing by the senior park ranger guide. You will then set out to track the gentle giants through thick vegetation as you hike up and down slippery slopes. An hour with them is a guarantee as you observe and learn their habits while taking photos. Have lunch thereafter drive to Rwanda. After breakfast drive to the southerly port town of Rusizi, alongside Lake Kivu. Today is largely a traveling day; you will enjoy the nice scenery of the lake and surrounding hilly countryside. Have lunch in karongi , then proceed to Rusizi, pro-ceed to the border then enter DRC. Transfer to your hotel for overnight. 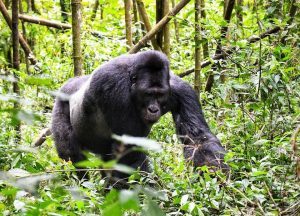 Wake Up Early Then Drive To Kahuzi Biega National park, be allocated forest guides who will accompany you into the forest in the process of habituating the eastern lowland gorillas. 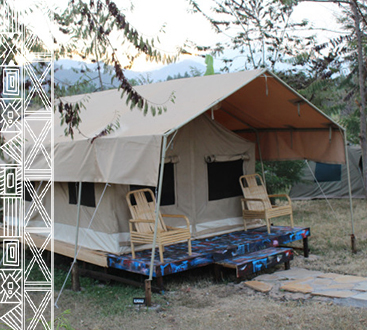 The activity will take whole day in the park, later in the evening drive back to Bukavu proceed to the border then re-enter Rwanda, proceed to Peace Guest House for over-night. After a leisurely breakfast road transfer to Kigali, stop in Huye and Nyanza to visit the Ancient King’s palace and the national museum, proceed to Kigali.